American Wolf: The Band: King Harvest. Ever since Donald J. Trump was elected President, part of me has been numb. I joked on my Twitter feed that I was going through the stages of Trump grief--denial, anger, depression, acceptance--but in truth, I have yet to get past denial. His election represents an America I do not know, an America that I can only fear from a distance. I need an America that I could hold close, a refuge, a place that felt like home, an America I could crawl into. Punk rock was too harsh and the best of the political stuff was British. Bob Dylan was too omnipresent in my life, he was more like a constant than a place to which I could retreat. Elvis was too big; bands of people I knew personally were too small. So I went to the most American place I knew in rock music: The Band's self-titled second album. I have long considered it "The Great American Novel" of rock and roll. I've been listening to The Band ever since. Technically, they are only 1/5th American--drummer Levon Helm is from Arkansas, while guitarist Robbie Robertson, bassist Rick Danko, pianist Richard Manuel, and organist Garth Hudson are all from The Great White North--but it doesn't matter; more than any other band, The Band has been able to define that quintessentially American sound, that quintessentially American idea, better than anyone else this side of Bob Dylan, who was their early collaborator and, one imagines, American spiritual mentor. As an outfit, The Band is both classic yet distinct--no other group in popular music can nail the way the way in which they could sound so simultaneously loose and tight. Helm is one of rock's finest and most thoughtful drummers; Danko's bass had a lilting, slippery sound that was the sonic equivalent of a paintbrush swishing its way across a canvas; Manuel's piano could be a Saturday night honky-tonk or a Sunday morning church service, pounding straightforward chords or adding lovely embellishments; Robertson's guitar often darted around the other instruments, sometimes blending back with chords and sometimes taking a brief spotlight with a stinging solo; Hudson was everywhere at once, his organ (and/or horns, accordion, keyboards, etc.) textures hanging like tapestries in the background, coloring the songs in ways that could only be felt. No wonder they got away with calling themselves The Band. The Band's music is a sweep that takes in the whole of rock and roll music. They began as the backing band for Ronnie Hawkins, a minor rockabilly singer who figured out that while he may be one in a million in America, in Canada, he was the only game in town. He went up with drummer Helm and, as his fellow Arkansas musicians drifted back down South, he replaced them with The Band That Would Be The Band. Eventually, The Band struck out on their own as The Hawks and earned a reputation as one of the hardest and toughest blues-and-R&B-based rock bands of the pre-Beatles era, playing an endless string of one-night stands up and down the coasts. When Bob Dylan was looking for a band to back him on his first electric tour, he reached out to them, and a legend was born. Although they only played on one Dylan studio release--the minor hit "Can You Please Crawl Out Your Window?" --they accompanied him for his infamous world tour of 1966 (minus Helm, who didn't enjoy being booed), where they all but invented the modern rock sound; they also stuck with Dylan after the tour when they all moved to Woodstock (with Helm back in the fold) and dabbled in the bottomless still water pool of American folk music in the basement of their ugly pink house, lovingly called Big Pink. The recordings made there have long since been known as "The Basement Tapes," while around this same time, The Band became known officially as The Band. Picked up by Dylan's manager, The Band was signed by Capitol Records in 1968, leading to their first album, Music From Big Pink, in July of that year. The record has gone down as one of the most influential rock albums of all-time. Like The Velvet Underground & Nico, it probably helps if you were there, but the lack of pretense, the slowness, the sense that this was a group of people listening to each other, blending instruments and voices, made it unlike anything else going on. There were no guitar solos, just winding songs that filled the American landscape with quasi-religious folk parables and wanderers, in a sound that was at once timeless yet new. A cover of Dylan's "Tears Of Rage" set the stage for an America that was lost within itself, but it was The Band's own "The Weight" that would deservedly become their most famous song. Although neither the song nor the album it appeared on was a big hit (stalling at #63 and #30, respectively), they stayed on the charts and the radio for months and months, serving as an essential midpoint between Dylan's John Wesley Harding and The Rolling Stones' Beggars Banquet as the way out of psychedelic rock. The following year, The Band followed Music From Big Pink with The Band. It was their finest album and one of rock's true masterpieces. The 12 songs seemed to touch upon every side of American popular music--rock, country, blues, and folk; love songs, badman ballads, sea shanties, and work songs; songs sung from the perspective of married men, old-timers, children, and thieves on the lam; there were drums, fiddles, horns, and what sounded like a radioactive Jew harp; one can hear crooning, harmonizing, shouting, and yodeling. "Up On Cripple Creek" was the closet they got to a hit--#25 in the U.S. pop charts, but it got them on The Ed Sullivan Show and the cover of TIME--while "The Night They Drove Old Dixie Down," the finest pop song ever written about The Civil War, was their contribution to The Great American Historical Songbook. More than any other rock music I've ever heard, there was a stamp of timelessness that marked the music; it was as though you could put these songs into any era of American life and they would sound organic, they would ring true, whether on the prairie or the plains, East Coast or West Coast, on the 19th century frontier, in the turn of the century city, or through a modern-day computer. It was magic music that was Americana the way few have touched before or since. And yet, up through when The Band was recorded, The Band themselves had not appeared on stage. Ever the single unit, they deferred live engagements after Danko was injured in a car wreck and wasn't able to perform. When they did finally emerge from the depths of Big Pink and their recording studios, it would alter their course forever. The conventional wisdom is that facing their audience--that is, the real America, after spending their creative time holed up in their own America--was startling, and led them to see the land for something closer to what it was, as opposed to how they imagined it. While this may seem a bit extreme, there is a definite shift in The Band's career from The Band to everything that followed, and the harbinger was the title of their third album, Stage Fright. While Stage Fright is an excellent, underrated album--and technically, a slightly bigger chart hit than The Band--it is not nearly as rich as the two albums that preceded it. In Helm's autobiography, much is made about Robertson getting sole songwriting credit for nearly everything on The Band (Helm holds the songs were written collaboratively), but on Stage Fright, the songs are written entirely by Robertson himself. Oddly, Helm has since disavowed large parts of his autobiography, including his feud with Robertson, but again, there is a tangible shift in material, regardless of the source. The singing feels less organic, the lyrics try harder, the music sounds slick as opposed to off-handed. There are still great songs--"The Shape I'm In" would become a Band standard for the rest of their career, and the title track "Stage Fright" was quite effective--but there were just as many near-missed or attempts. A naturalness was gone from their music. Still, The Band soldiered on. It is said that Robertson took over The Band in order to save it, and their fourth album, Cahoots, seems to confirm it. Again, nearly all of the songs are by Robertson but the vignettes and character sketches now sound strange; for the first time, the album was not a hit, influentially or commercially. Tellingly, only one song from Cahoots--"Life Is A Carnival"--was included in their following live album, Rock Of Ages, a double-LP that found The Band remaking their catalog with a horn section to a rousing success. Though largely forgotten today, it was chosen by Rolling Stone as Album Of The Year, and contained their second--and to date, last--Top 40 hit, their masterful remake of Marvin Gaye's "Don't Do It," which made it to #34. "Don't Do It" is the rare rock and roll recording to tell the history of the music--built around the Bo Diddley Beat, stopping for funky breakdowns, and containing doo-wop-esque longing harmonies, this was a four-and-a-half minute history lesson posing as state of the art rock and roll. It kicked off Rock Of Ages in true style, the rest of which was largely comprised of cuts from their first three albums. The album's closer, a cover of Chuck Willis' "(I Don't Want To Hang Up My) Rock And Roll Shoes," was selected as a follow-up single; it bottomed out at #113. As implied by "Don't Do It" and "Rock And Roll Shoes," it seemed The Band's most exciting way forward was to go backwards. 1973 brought Moondog Matinee, a cover album of old rock and R&B tunes The Band played while cutting their teeth with and without Ronnie Hawkins. A version of Helm singing "Ain't Got No Home," originally by Clarence "Frogman" Henry (who, like Ronnie Hawkins, is still alive, by the way) was a minor hit at #73, but far better was Manuel's take on Bobby "Blue" Bland's "Share Your Love With Me," which could only be heard within the grooves of the album. Much like Music From Big Pink tapped into a larger turn away from non-psychedelic rock, Moondog Matinee can perhaps best be heard alongside contemporary nostalgia albums like David Bowie's Pin-Ups and John Lennon's Rock And Roll. And then, just as they were reaching the end of their rope playing rock covers as Levon & The Hawks, The Band once again teamed up with Bob Dylan and revitalized themselves. They backed Dylan on his first(!) #1 album, 1973's Planet Waves, and then backed him on a split Dylan/Band tour in 1974, summed up on the live Before The Flood. They regrouped the following year to record their last great album, Northern Lights--Southern Cross, definitely their finest work since Stage Fright and possibly since The Band. Although they recorded it as continuing creative outfit, hindsight has proven it to be a worthy studio farewell. The following year, Robertson decided it was time to retire The Band from the road, and so for the bicentennial Thanksgiving, they staged The Last Waltz, a grand concert featuring The Band, a horn section, and their famous friends from along the way (Ronnie Hawkins, Bob Dylan, Eric Clapton, Neil Young, Joni Mitchell, Van Morrison, and a bunch of others), which was filmed as a documentary by Martin Scorsese and released as a triple-LP live album by Warner Brothers. Once again, the vast majority of music by The Band was at least half a decade old, and while the performances were solid, they were nothing compared to the Rock Of Ages double album from only four years before. Among the finest new interpretations though was a version of "The Weight" with The Staples, who brought out the gospel leanings implied in the song all along. Oddly, The Last Waltz wasn't intended to be the retirement of The Band as a working band, only as a touring one. And so, the following year, The Band released what was to be the last studio album of the classic lineup, the disappointing Islands. 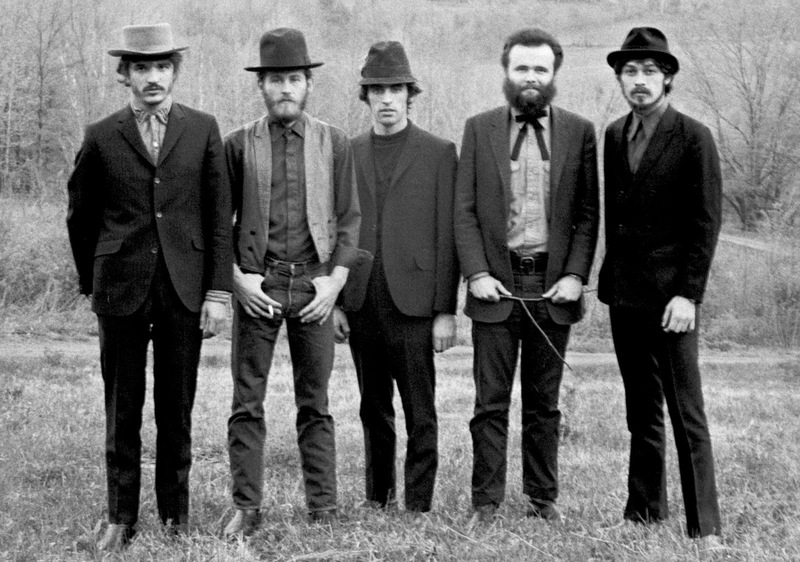 It sounded like the roundup of leftovers that it was, most of it being recorded before The Last Waltz project began. Not long after, Robertson left the group, leaving Helm, Danko, Manuel, and Hudson to continue on through Manuel's death in 1986--even releasing a few albums with a new guitarist and keyboardist in the '90s--and end with Danko's death in 1999. Helm continued performing Band songs until his death a few years ago in 2012; only Robertson and Hudson now remain of the classic lineup. The Band is one of those groups that should be easy to anthologize, but in reality prove to be much trickier. The main problem is that they are primarily an album band, as opposed to a singles one. Couple that with the fact that their first two albums far exceed all of their other work, and you've got problems of balance and representation. And with only two bonafide Top 40 hits, non-single "standards" in the context of the group regularly appear on compilations, which were either fan favorites or concert staples, such as "Chest Fever" and "King Harvest (Is Sure To Come)." In 1976, The Best Of The Band appeared, which contained most of the songs you'd expect along with the non-LP non-hit single "Twilight." To this day, it is the only single-disc collection you can get that actually contains their two Top 40 hits. Two years later saw the double-album Anthology, which filled the story out and added a few cuts from Islands, the dismal "Right As Rain" and the wonderful "Livin' In A Dream." It also omitted both the non-hit "Twilight" as well as the hit "Don't Don't Do It" from The Rock Of Ages album, but began the long tradition of putting "Acadian Driftwood" from Northern Lights into The Band canon. Both The Best Of The Band and Anthology were issued on CD; they were soon joined by others. In 1989, The Band received their first compilation of the CD era with the two-CD To Kingdom Come: The Definitive Collection (long out of print, though it can still be found on iTunes). Aside from a previously unreleased version of Chuck Berry's "Back To Memphis," it contained almost all of the usual suspects, plus a few rarities: The unreleased studio cut of "Endless Highway" and the studio version of "Get Up Jake," which had only been released as a live recording on Rock Of Ages. It also contained their lovely Christmas song, "Christmas Must Be Tonight." And then The CD Box Set Era came. By the mid-1990s, very major artist needed one, and just in time for the 1994 Christmas Season there came Across The Great Divide, a three-disc retrospective in a big box with a big booklet. This was the collection that broke the mold. The first two discs were the standard run-through of their hits and classics, but the third contained rarities, including some of their much-talked about but at-that-point-impossible-to-find Levon & The Hawks material. The disc played like an alternate history of The Band, and did so marvelously--some Basement Tapes material, live tracks including a cut from The Woodstock Festival, the non-hit "Twilight" single, and highlights from The Last Waltz. If hindsight has shown that some material was AWOL (the much-maligned "Time To Kill," which was a minor hit at #77, as well as the other non-hit, non-LP single, "Georgia On My Mind," which has yet to appear on an American compilation), it was one of those rare collections that felt like the whole story, even if it wasn't. With the new millennium--or, more tellingly, The Beatles' 1--every major rock artist needed to put out their single-disc CD of essentials, and The Band was no exception. Somehow, a Band album called "Greatest Hits" had eluded them up to this point, and so, The Band's Greatest Hits was born. (OK, The Band's Greatest Hits came out only 13 days after The Beatles' 1, so it was probably already in the works; either way, I bet Captiol was kicking themselves for letting a quarter century go by since their last official single-disc best-of.) It remains the default best-of to buy with all of the major classics ("The Weight," "Up On Cripple Creek," "The Night They Drove Old Dixie Down"), many of the minor hits ("The Shape I'm In," "Life Is A Carnival," "Ain't Got No Home," and FINALLY, "Time To Kill"), as well as those fan-favorite standards-in-the-world-of-The-Band ("Chest Fever," "King Harvest," "Acadian Driftwood"). And yet. For an album called Greatest Hits, it leaves off half of their Top 40 hits, which is to say, "Don't Do It," from Rock Of Ages. This is truly mind-boggling when one considers that they did include "The Saga Of Pepote Rouge," a perfectly-fine song, sure, but is clearly there if only to represent Islands. Any review of this album you read should be docked one star for this inexcusable error. By 2005, Across The Great Divide was long out-of-print and the good people of Capitol Records simply did not know what to do. So for some reason or another (The 40th Anniversary of The Band teaming up with Dylan? The 30th Anniversary of "Ophelia" scraping the charts?) they released A Musical History, a deluxe five-CD, 1-DVD boxed set that featured 102 sound recordings, 9 live videos, and one hard-cover book. It sought to be the final word on The Band, and it essentially was. For the first time, their entire story was told from The Hawks to Dylan's backing band to The Band, with over 30 rare or previously unreleased recordings. For the diehard Band fan (and what other kind of fan is there, really? ), it was amazing; for anyone else who was less interested (or less financially padded) there was a single-disc best-of CD that mixed hits and rarities to tell an abridged version of the story. The latter picked out most of the larger set's essential rarities, the twin victories being Robertson's solo run-through of "Twilight" (which sounds like a demo, even though it was apparently was recorded after the single version) and Danko's lovely "Home Cookin'," a casual team effort with a natural sound that so often eluded the group after Rock Of Ages. Now, as with any major band attempting to make a definitive boxed set, there are some issues. The main one for me is that hard-to-strike balance between too much and too little, especially in the case of an act like The Band, whose first two albums are near flawless (and have all but one song represented in some form or another on A Musical History between them--sorry, "Jawbone"). It's always great to hear undeniably outstanding music, but as a document, it staggers the flow of the listening experience. There is also the case of length. I love The Band, but 5 full discs can get a bit unwieldy even for someone like me. I'm happy to have it, but it's hard to get through as a front-to-back listening experience. Furthermore, since then, there have been more recent one-disc overviews Opus and Icon, which fall somewhere between a "best of" and a "finest songs" collection; of course, both contain "Up On Cripple Creek" but not "Don't Do It." So what's a Band fan to do? I spent weeks trying to come up with a definitive Band collection, which I have termed my "King Harvest" project. It has resulted in three different Band collections: A one-disc, two-disc, and three-disc version, in the spirit of Greatest Hits, To Kingdom Come, and Across The Great Divide, respectively. The goal was to find a line between quality and history, with an eye on listenability. To guide my approach, I took an inventory of all the above-mentioned compilations, plus an additional dozen of the international vinyl, cassette, and CD era. Many were European, Japanese or Australian. My only condition was that the album had to contain the original studio versions of "The Weight," "Up On Cripple Creek," and "The Night They Drove Old Dixie Down"--so long as these original recordings were included, any collection was game. I see those as the bedrock of any decent Band collection. But as lovely as the idea of a "Greatest Hits" album is for The Band, their lack of hits and rich history make them a unique candidate for a Beatles' Anthology-style mix of hits and history. This is what makes A Musical History so compelling; it is also what makes The Best Of A Musical History another near-miss like the Greatest Hits album. I consider those 9 songs that make 15 Band compilations or more the center of The Band Canon--"The Weight," "I Shall Be Released," "Up On Cripple Creek," "The Night They Drove Old Dixie Down," "The Shape I'm In," "Stage Fright," "Life Is A Carnival," "Ophelia," and "It Makes No Difference"--along with the live version of "Don't Do It," as the 10th, as it comprises one half of their Top 40 hits. With this in mind, the one-disc version of the King Harvest project is built around those 10 songs, with key other songs, live performances, and outtakes added around them to comprise a full portrait of both hits and history. Determining the scope was a bit more of a challenge. 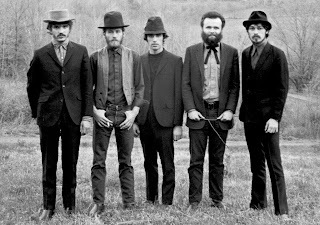 I initially intended to take things back to Ronnie Hawkins, then see it through Levon & The Hawks and Bob Dylan before reaching the "modern" Band, but while that is historically instructive, the essence of The Band lies in the decade that covers their 1967 Basement Tapes recordings through their final 1977 studio recordings for The Last Waltz. In this one-disc overview, only The Band is represented with 3 songs; all other studio albums are represented with 2, with the exception of Moondog Matinee and Islands, which have a single song apiece. In many ways, the 2-disc version is the crown jewel of this project. Is it any wonder that Across The Great Divide is long out-of-print while To Kingdom Come is still available on iTunes? 40 songs allows for a very strong sampling of The Band's catalog; there are 6 songs from The Band, 5 songs each from Music From Big Pink and The Basement Tapes, 4 songs each from Stage Fright, Cahoots, and Rock Of Ages, 3 songs from Northern Lights--Southern Cross, and 2 songs each from Moondog Matinee and Islands, plus a small lion's share of rarities that derive from A Musical History. "Mystery Train" was originally slated to make the final cut, but its length and funkier sound broke up the flow of the pure Band Americana to my ears. I also feel like 2 songs is more than enough to cover Moondog Matinee, and the best songs to do it is the Top 100 hit "Ain't Got No Home" and the finest song on the album, "Share Your Love." Band purists may balk, but that's how I hear it. After much deliberation, these 40 songs capture the essence of The Band. And last but not least, here's King Harvest, Three-Disc Edition. This is the true harvest of King Harvest, with 7 songs from Music From Big Pink, 8 from The Band, 5 apiece from Stage Fright, Cahoots, and Rock Of Ages, plus revealing alternate takes, outtakes, and demos that fill out the story. After all, in its own way, the studio version of "Don't Do It" is just as marvelous as the more familiar live version, while songs like "Endless Highway" and "Loving You (Is Sweeter Than Ever)" have become virtual Band standards, even though they were never released while The Band was a functioning unit. King Harvest has it all, with the 21 tracks from the crucial 1967-1969 period in "To Kingdom Come"; 20 tracks covering the solid 1970-1972 period in "Stage Fright", and 19 tracks covering the underrated 1973-1977 period in "Twilight", for a total of 60 tracks in all. No Ronnie Hawkins, no Bob Dylan, only The Band, in a much more digestible compilation than the wonderful but overwrought A Musical History. Hear them step onto the center stage as one of the most influential bands of all-time in "To Kingdom Come," retreat back from the spotlight in "Stage Fright," and then search for a way home in "Twilight." It is an epoch contained in a band, or rather, The Band. Post-Trump Reality: The First 50 Days.